On January 27, 2017, US President Trump issued a temporary travel ban to seven predominantly Muslim nations in the name of national security. I can’t help reflect on the giving that the Bayanihan Foundation has made possible with Filipino Christians helping Filipino Muslims and moving the community closer to peace. 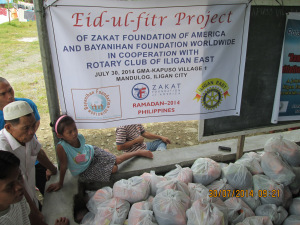 In August 2014, during the Muslim holy day of Eid Ul Fitr, the Zakat Foundation of America has partnered again with the Bayanihan Foundation and made it possible to distribute hundreds of food packages and providing much-needed food relief to over 1,000 men, women and children during the holy month of Ramadan. The Zakat Foundation of America, is an international charity organization that helps generous and caring people and reaching out to those in need. 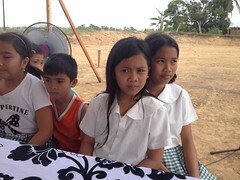 In 2014, the Bayanihan Foundation is honored to partner with the members of the Rotary Club of Iligan East who donated their time and helped put together and distributed the food packages. Filipino Christians giving packages to needy Filipino Muslims created the unintended effect of goodwill, friendship and the slow earning of trust among Filipinos of different faiths and is slowly moving island of Mindanao, Philippines closer to peace.